This morning as I watched Looney Tunes with my kids, I found myself contemplating the upcoming presidential election. I came to the conclusion that the two subjects are not as divergent as one might think. As Wile E. Coyote launched yet another unsuccessful attack on the Road Runner, it occurred to me that perhaps Mr. Coyote’s skill set would be better suited in another arena. He is clever, determined, creative, hyper-focused, and a self-proclaimed Super Genius. Sounds like a politician to me. And then I thought about the current candidate landscape for the 2012 election. In that moment, a small cartoon light bulb flashed into existence above my head: What if Wile E. Coyote were to throw his hat into the ring? Everyone is always talking about how we need a political outsider who hasn’t been corrupted by Washington. And I ask you, who is more of an outsider than Wile E. Coyote? Now, it’s true that Mr. Coyote’s record is less than stellar regarding his ongoing objective of catching the Road Runner, but I don’t think we can compare catching the Road Runner with being the leader of the free world. That bird is one slippery little devil. Here are a few things Americans could look forward to if Wile E. Coyote became the next President of the United States. Defense contracts with the Acme Corporation. 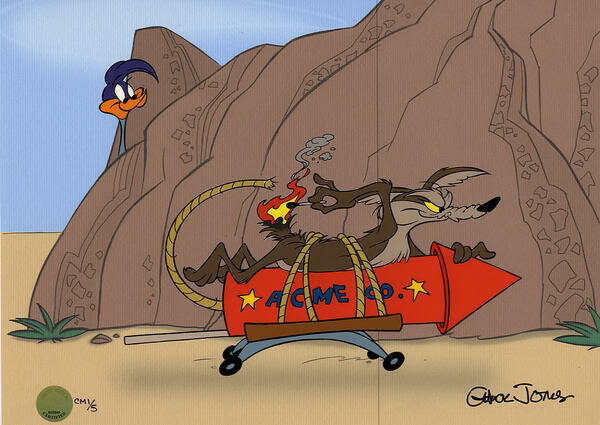 Wile E. definitely has some sort of ‘in’ with the Acme company. Their catalog is filled with exciting and out-of-the-box weaponry that could really jazz up our military arsenal. Imagine what we could do with Dehydrated Boulders, Giant Magnets, Integrator Pistols, Giant Rubber bands, Spring Rocket Shoes, Building Disintegrators, Giant Sling Shots, and the like. Plus, their turn-around time is second to none. Creative problem solving. Wile E. Coyote has a long tradition of coming up with creative strategies to solve his problems (really it’s just the one problem –with the bird). But his resourcefulness, if applied to domestic and international issues, could completely revolutionize the United States’ approach to a number of vexing problems. Think, for example, the effect that Wile E.’s long-established tactic of painting tunnels on the side of mountains could have on our border problem? Transparency in government. No need for probing investigative journalism to find out what’s going on in his White House. 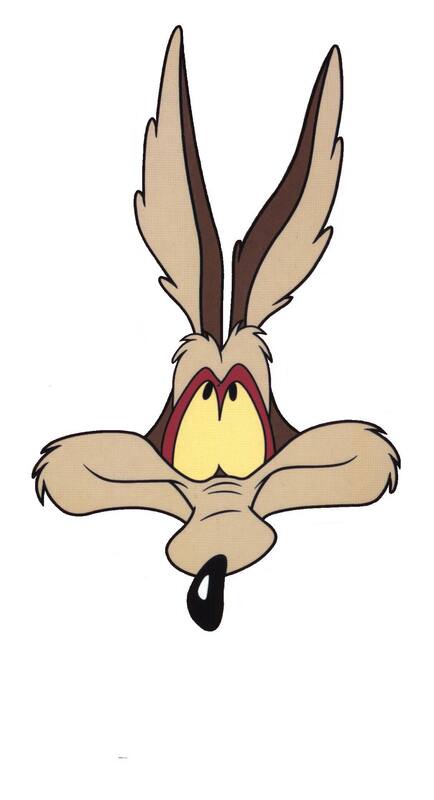 Wile E.’s ears would tell the American public all we need to know. Straight up: Things are good. Straight down: Things are bad. Burned to a crisp: Things are really, really bad. No useless rhetoric. 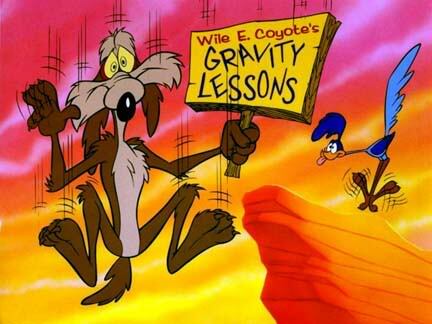 Wile E. Coyote communicates largely through short messages crudely scrawled on wooden signs. Americans could depend on Mr. Coyote to be direct, succinct, and to-the-point in all of his communications. Wouldn’t that be a refreshing change? A never-say-die attitude. It’s gonna take more than a failing economy, astronomical debt, sky-high unemployment, unpopular foreign wars, and a housing crisis to rattle this coyote’s cage. He has proven time and time again that he will not back down in the face of insurmountable odds, no matter what the personal risk. Here’s a guy who has been blown up, smashed to smithereens, gored, flattened, shattered, burned, cut-in-two, electrocuted, and fallen off countless cliffs ending in a puff of smoke, only to rise from the ashes to try, try again. I think we could all learn a little something about work ethic from this coyote (Hardheadipus Delirius, Appetitis Giganticus, Carniverous Vulgaris, Hungrii Flea Bagius). 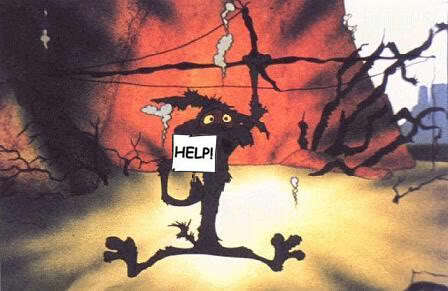 And I think America could do a lot worse than Wile E. Coyote for President. All images were downloaded from Photobucket and (I’m sure) are property of Warner Bros.